Do you ever feel like you’re back in grade school, or goodness forbid- high school? You can picture the situation. Your web designer (like your teacher) has sent you a request for content, and you know it’s important. However you just don’t know where to start! You sit down to tackle the task at hand and quickly become preoccupied. All of a sudden dinner needs to be made. The kids need attention. The phone keeps ringing. But most of all, you can’t silence the nagging voice in the back of your mind that reminds you that you weren’t so great at writing in school, and that you didn’t like it that much anyway! So now what? You have an awesome website being built that will make your business look like a rock star, but you just don’t know what to say about it. Sure, you work in your business every day, but how do you put into words everything that you offer in a way that makes sense? First off, try not to feel bad about it. All the negative thoughts you are thinking about creating compelling content for your business will only drain your imaginative energy and douse your creative spark. It is important to remember that content creation is often difficult for many small business owners. If you are struggling to come up with the right words to convey your message, you’re not alone! The first step in creating compelling content is to be mindful of your topic. It is important to know your audience and to choose a pertinent subject that will engage them. The more relatable the topic is, the higher your response rate will be. However in choosing wisely, if you are going to write about political topics or other topics that have strong emotions tied to them, proceed cautiously. Your topics are also a reflection of your brand. If you want your brand to express your political or religious beliefs, by all means jump into the pool! There are a variety of sources to find interesting data and explore topics that relate to your business. A surefire way to engage an audience and gain momentum is to tell a story in a typical narrative fashion. Create an identifiable character and let them convey your message. There are a variety of mediums available to you in storytelling, and the goal is to create content that is not just informational, but also entertaining. Be you and create content that reflects who you are. When you go to a restaurant, you expect the server to know everything about the food on the menu and to be able to answer any questions you might have. It is the same with visitors to your website. Potential clients are coming to you for vision into your industry, so it is important to share with them information and insights that only you can provide. You want to establish yourself as an expert in your field, and an excellent way to do so is to provide content that highlights your knowledge in a way that your competitors cannot. In order for clients to best identify with your content, there needs to be a call to action. It might be as simple as saying “contact us now” or “visit our store,” but it is one of the most important elements to include. You’ve wowed them with creative and pertinent ideas, so now invite them to participate! 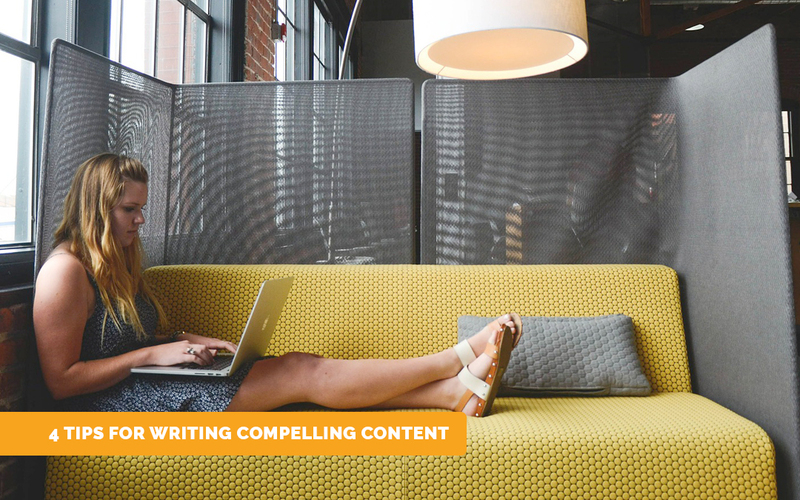 You are not alone in your quest for creating compelling content. Although it might not always be easy to come up with fresh ideas and creative ways of reaching clients on your own, you have a creative and competent web designer on your side. Put your words and your business in capable hands and contact Rosepapa Creative today for assistance in creative copy writing. Website Design Trends for 2019 – Staying Power Small Business Saturday 2018 – 8 Creative Marketing Tips for Small Business Owners Politics and your Brand – 3 Tips Before you Dive In!